N19.06178 W100.09041 7,700' MSL 2,200' AGL Not rated. We suggest a pilot rating of H/P3 or H/P2 with an instructor present. This is NOT a site for beginners! Southwest Airsports trips to VB are hosted by Jeff Hunt of Fly Mexico. Fly Mexico takes care of transportation, retrieves, rescues, accommodations (1st class or bunkhouse – whatever you can afford), adult beverages after the day's adventure, where to eat, translation (if you do not speak Spanish), and just about any need a pilot might have. They also provide equipment and instruction in both HG and PG, if needed. To sum up, pilots need only focus on their flying adventures. Here is a link with information on a typical hosted trip with Jeff Hunt. 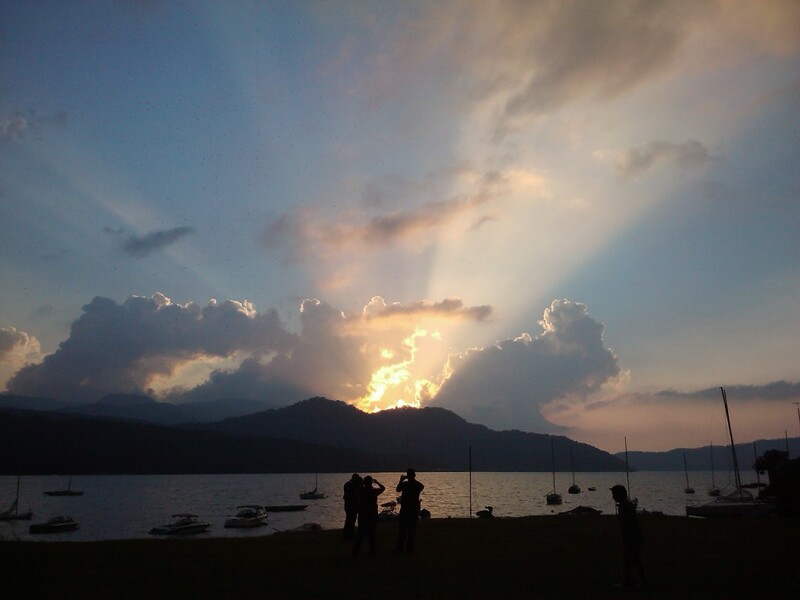 Valle de Bravo (VB), Mexico is the quaint town that hosts this amazing site. (Here is a map of VB.) While this site can be challenging to expert pilots, the conditions in November and early December are mild which are ideal for recreational pilots. It is also relatively un-crowded at this time of the year. VB has about 20,000 people and is nestled deep in the mountains of central Mexico on the eastern shore of a beautiful lake. For general maps (JPG) of VB with the major landmarks noted go to this page. Garmin owners may purchase a detailed topographic map of Mexico. In case you go down somewhere, you will also have a map of the roads so that you can walk out if you have to. Below, flying above cloudbase about 4.5 northeast of launch 10,000' MSL. There are few places in the world where a pilot can develop his thermalling skills as here – beginning to advanced. The launch area is the top of a ridge and faces WSW. Thermals to the immediate left of launch are remarkably consistent averaging about 500'/min from about 10:30AM – 4:00PM CST for the winter season which spans most of November - February. Cycles average about 5 minutes in length. Pilots with modest thermalling skills can get 2,000'-3,000' above launch. Getting this high is required to easily glide to other beautiful sites nearby. Pilots who get low at launch routinely can have multiple chances to find another thermal in the same location or thermals farther out in front. Thermals consistently pop off the spine to the south (left) of launch which zigzags its way up from the valley below. 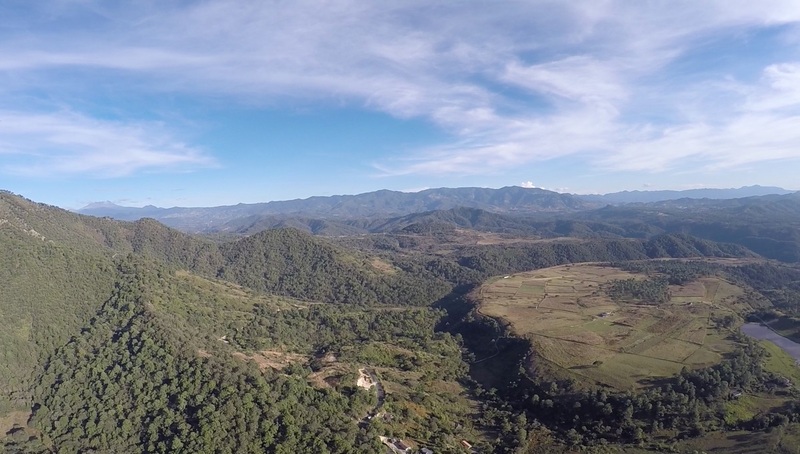 This is El Peñon, the first stop from launch (a mile or to the right of the photo here). Dangers at the site are minimal. Most mishaps happen at launch to pilots with poor kiting skills. Common sense is required. Never get low downwind of the numerous ridges, mountains, and peaks as the mixture of sink, rotor, and turbulence can be severe, especially behind the launch area. Keeping at least 1,000' above the terrain downwind of any geography is advisable. (Note: these guidelines apply to any thermal site.) All pilots should keep a safe LZ in view within an easy glide at all times for safety. 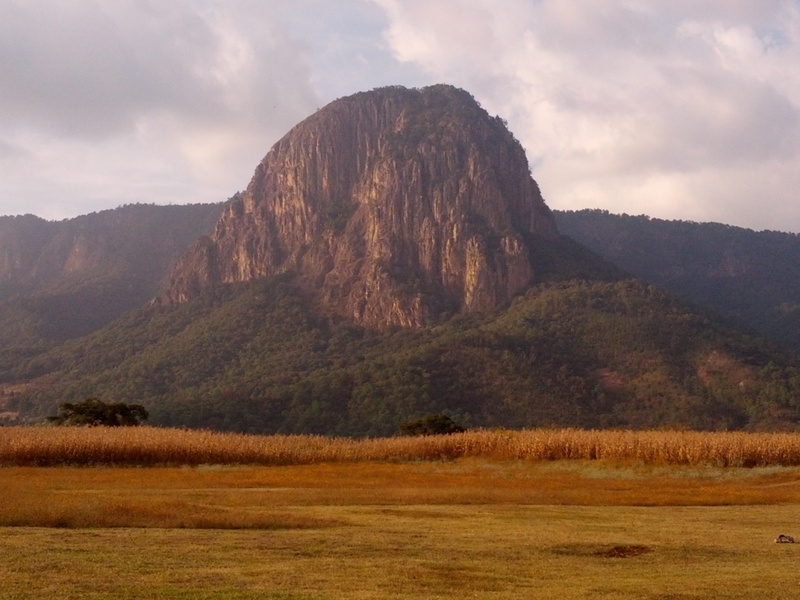 The main LZ, "The Piano", is at the center left of the huge mesa in the right of the photo. Launch is just past the left edge of the photo. I have landed just about everywhere in this photo except where there is a tree. El Peñon surrounded by clouds. Valle de Bravo has pilots coming from all over the world during the flying season and can be crowded around the Christmas holidays. Consequently, all pilots must learn some skills in flying with others. One of the most difficult is safely flying in a gaggle of 30 pilots or more. While it is easier to thermal (the other pilots can will act as guides to the lift), the primary concern is not colliding with other pilots. 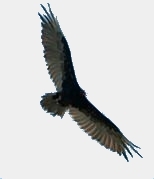 Often gaggles contain inexperienced or careless pilots who are a nuisance or danger to everyone. Aggressive and rude pilots are also annoying. But this is almost always true only at launch. Once you get cross country, the numbers drop 80% and you usually fly only with those who are experienced. And here is the treat: Thermalling with 2-4 other pilots can be outstanding because the small gaggle can really zero on the core of the thermal. So, when conditions weaken (as they always do), the gaggle has a greater chance of staying aloft than the single pilot. I once flew in a gaggle with two German pilots out in the flats – we would have all sunk out if we had not focused on each other every moment. As it was, we carefully climbed to altitude in a very weak thermal – and went far, far away. It was hard work as it takes 100% of every bit of mental skill one has. But it is always worth it as the thrill of defying gravity without the use of any other power but the sun is without comparison. Below is a photo of the LZ in town. It is fairly large in this photo. Normally, the LZ is about a third this size but the lake was low when this photo was taken. A typical day begins with a breakfast at one of the many restaurants in this ancient town. 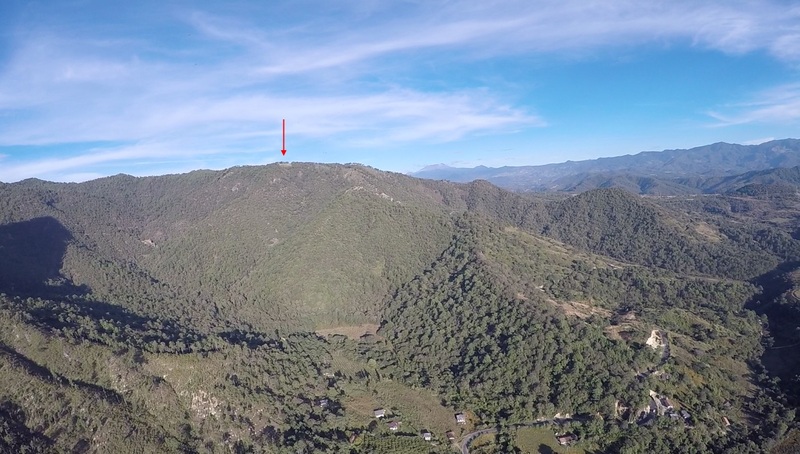 At around 10 AM, it is important to set out for the launch area south of town (about 15 miles) called El Peñon (the pointed rock peak in the photo lower right). From here, pilots can choose to enjoy the view, help other pilots, take a sled ride to the huge LZ to the west, or try their skills at working the thermals that are abundant in the area. The air is predictable at this time of year. Pilots can choose to fly to "The Wall" via El Peñon and, if they like, setup for a XC trip back to VB or elsewhere. Another favorite route is to go east and follow the valley behind launch to an excellent luncheon hang-out called Javon's. Pilots can enjoy simple but first class Mexican fare that is prepared on the spot. You don't even have to know Spanish as it is like a buffet. (Generally, the food in central Mexico is much like border food but not as spicy.) These are some of the routes pilots can try. If you don't make a destination, Jeff will see to it that you are picked up wherever it might be or, if you are far off the beaten track, help you get a cab back to VB. After a pleasant lunch, we pile in the van again and head back to VB for an afternoon of whatever you want: Exploring VB, shopping, resting, or heading to the soaring ridge behind VB for more flying (see photo below). Please contact us to get more information or to make reservations for a great flying vacation.